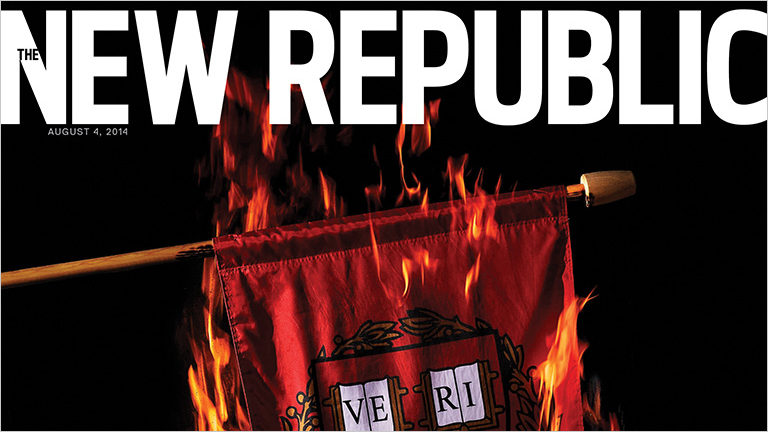 A massive management reorganization at The New Republic has led to widespread staff resignations, with dozens of employees leaving the magazine. At least 35 former TNR staffers and contributors (UPDATE: Now reportedly 55. See below for details.) took to social media to announce their resignations and express their disgust at how TNR owner Chris Hughes and CEO Guy Vidra were running the 100-year-old publication. The exodus started Thursday, after editor in chief Franklin Foer and literary editor Leon Wieseltier said that they would be leaving the company. Shortly after, recently appointed Vidra sent a staff memo saying that Gabriel Snyder, a digital advisor at Bloomberg and former editor of The Atlantic Wire and Gawker, would be taking over Foer's role. Vidra, the former general manager of Yahoo, was hired by Hughes, who co-founded Facebook, in October. Even more suprising, however, was Vidra's announcement that TNR would be slashing print frequency from 20 to 10 issues a year and moving from its longtime home in Washington, D.C., to new headquarters in New York. "Given the frequency reduction," Vidra added, "we will also be making some changes to staff structure." Former TNR senior editor Julia Ioffe made it abundantly clear in a Facebook post that the majority of the staff had no problem with the publication moving toward a more digital-friendly format. Ioffe pointed out that the mission of TNR was always to try new things. "There was no opposition in the editorial ranks to expanding TNR's Web presence, to innovating digitally. Many were even onboard for going monthly. We're not afraid of change. We have always embraced it," she wrote. What they took issue with was the way that the staff was treated by the new management. She told The Daily Beast that Wieseltier told her that he had never seen an editor "disrespected and dicked around—I'm paraphrasing—as Frank has been treated for the last couple of months." "Leon [Wieseltier] said that we shouldn't be depressed and think this is all about clicks, that we should retain our lofty ideas about journalism and making an impact on the world through journalism, through writing and ideas, and not through 'digital media companies,'" she said. That strategy, however, appears to have changed drastically. In September, Hughes hired Vidra, former general manager of Yahoo, as CEO. Shortly after, Vidra told The New York Times in an interview, "I don't call [TNR] a magazine at all. I think we're a digital media company." And in yesterday's staff memo, Vidra reiterated that goal, writing, "As we move forward under Gabriel's leadership, we are reimagining The New Republic as a vertically integrated digital media company." BREAKING: TNR will not print another issue until Feb. Issue scheduled for Dec. 15 was canceled after most writers pulled pieces in protest. Peter Bergen, CNN's national security analyst, has also asked to have his name removed from TNR's masthead. That makes 55.